The traditional Swiss Glardon/Vallorbe company (formerly Grobet-Swiss) makes top-quality precision files which meet the high quality standards of the watch industry. 200 years of experience come to the fore in excellent durability and sharpness. The files are designed for working steel, but they are equally sujitable for fine working of wood, aluminum, brass and hard plastics. Hardened to 64-65 HRC.Although these files were originally developed for watch makers they are exceptionally well suited for woodworking, also. The workmanship and edge-holding ability of their cuts are of superb quality. The density and height of the cutting edges depend on the cut number AND the length of the file. 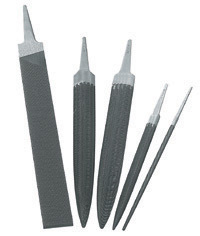 Set of 4 saddle files.